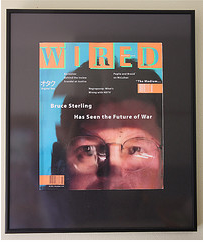 My framed 1993 premiere issue of Wired, hanging on my kitchen wall. One interesting thing about Wired’s premiere issue is that internet was only mentioned twice. This was deliberately, as they wanted Wired to be about everything digital and how it transforms society. But internet would soon become an important subject for Wired and they also launched their own internet services like the search engine HotBot and their online magazine HotWired where they ignited the banner ad format. 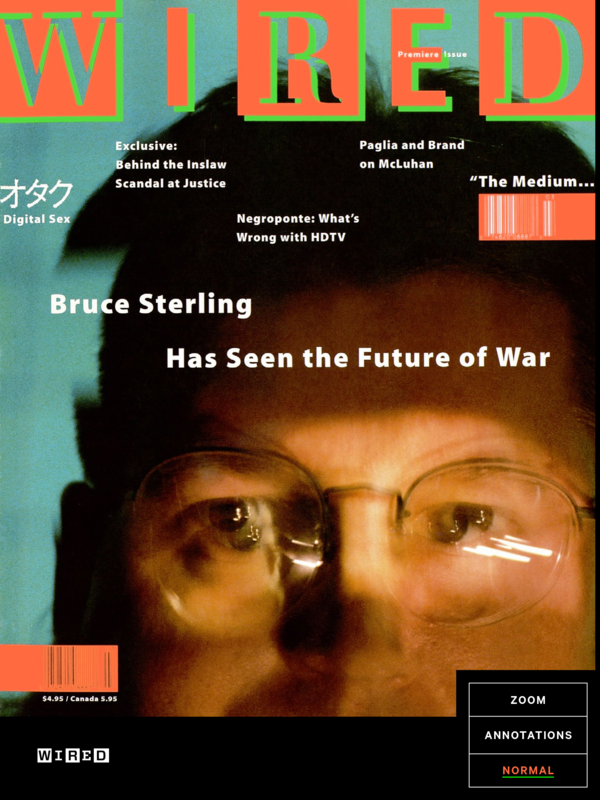 I do feel that Wired has lost most of its original quality since 2001 when the editor Chris Anderson took over and steered it away from the long essays on tech and societal development and converting it more into a guys gadget magazine. But I still read Wired online and sometimes find inspiring pearls. But I stopped buying the Wired iPad edition since I find it annoyingly similar to the old CD-ROM format that I produced so much of in the 90s, I wrote about that in my post: iPad media apps: CD-ROM revisited. This is an important historic document! I do encourage everyone interested in internet history and future digital development to read the Wired premiere issue on an iPad. Turn on the wonderful annotations where you get inside information and today’s perspective on all the articles and ads. 19 years with Wired, what’s next? Mosaic, the first “visual” web browser. GSM mobiles had just emerged, but were still seen as expensive “yuppie toys” by most people. So in these 19 years we have seen a big transformation of our society and the ways we live, work and communicate. Do you think that the next 19 years will show less or more progress? I think much more! The development curve is getting much steeper now that we have so much infrastructure in place in the form of broadband mobile networks and inexpensive development tools and sensors. The electricity in the early 20th century. These are silly names that will disappear shortly when we start taking for granted that “everything” is as connected to internet as we are. The benefits and possibilites are endless when our machines, gadgets, bodies, cars, tools and environments are all online, communicating both with each other and with us humans. The new breed of really inexpensive sensors and wireless data connections enables creativity to flow in all kinds of areas. For example in the medical sector, where my focus is, there are already numerous personal health and fitness tracking devices and mobile applications, in a few years they will transform health care as we know it. So I encourage everyone to read this historic issue of Wired with the annotations. Then engage yourself in discussions on how we can learn from this history and make the best of all the exciting digital possibilites lying in front of us! Internet of Things? Machine 2 Machine? It’s all about people! And health! M2M is really taking off now after years of hype. But most user cases until now have been about logistics and monitoring devices. The goal of the seminar, as stated by the moderator Magnus Melander was to highlight many new types of uses for M2M solutions that exist today. M2M usually means Machine-to-Machine communications, smart little devices that can connect with each other and internet. In reality it is often about Man-to-Machine (us controlling machines) och Machine-to-Man (machines reporting to us). But for me the social possibilities are equally important, that we can create valuable connections between people using wireless sensors and mobiles to facilitate Man-to-Man communication. Internet of Things is also a somewhat misleading term, as there is only one internet that is used by both people and things, devices, machines. What’s new is that there is now an enormous number of inexpensive and smart sensors and platforms that make it very easy and inexpensive to connect things to internet and share the data in the cloud, thereby creating new types of services. I see the possibilities with Internet of Things as the fourth digital revolution, just as important as the first three: microprocessors and the PC, internet and smartphones. Problem: Excercise is boring. Step counters are boring and you don’t bother noting down your steps per day or take up any challenges from your work mates. Result: Increased motivation to change your behaviour and excercise. Solution: The Withings wifi body scale logs your weight, body fat and BMI automatically. 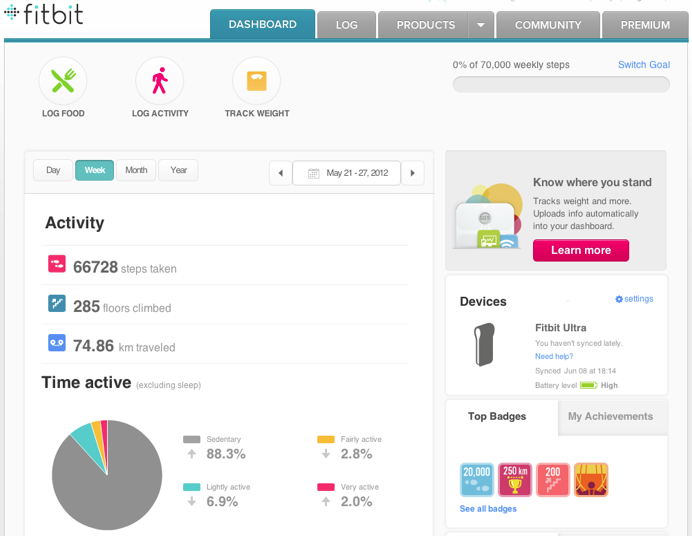 As soon as you step off the scale, your data is uploaded via wifi to your Withings mobile app and your Withings web account. The ability to upload sensor data data automatically is a key factor for success! Result: You start monitoring your weight in a much more useful way when you see your change over time in diagrams, making it easy to see changes during your vacation, when you start excercising etc. Problem: Diabetics struggle to log their blood sugar levels and insulin treatments. 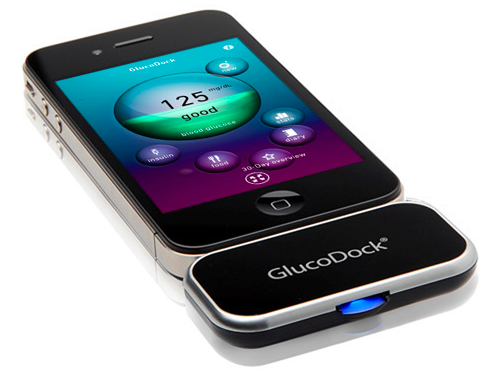 Solution: Glucodock is a blood sugar measuring device that is attached to your iPhone. You measure you blood sugar level as usual by letting a test strip absorb a drop of blood from your finger, but the result is immediately shown on your iPhone screen and logged in the app. 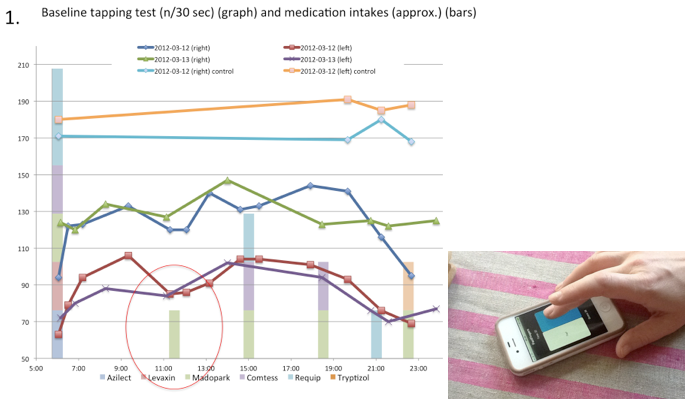 Result: Your blood sugar and insulin diary integrated into your mobile, giving you a good overview. You can also email your data to anyone, for example your doctor. However, there are no other ways to share your data online, which is a major drawback in my view. There is a strong trend in medical care, moving the focus from hospitals and doctors to the patients themselves. The patients are getting involved in their own treatments at a much higher level than ever before, especially for chronic diseases. My project partner Sara Riggare has had Parkinson’s disease since her teens. 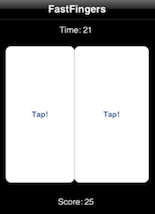 The four bottom curves are Sara’s right and left hand tapping tests for two days. The top two lines are from her control group; her husband. Sara noticed that she has a dip around 11AM and that her stiffness decreased when the effects of her 11AM drug intake of Madopark kicked in. So she decided to take her Levaxin a bit earlier in order to even out this midday dip. 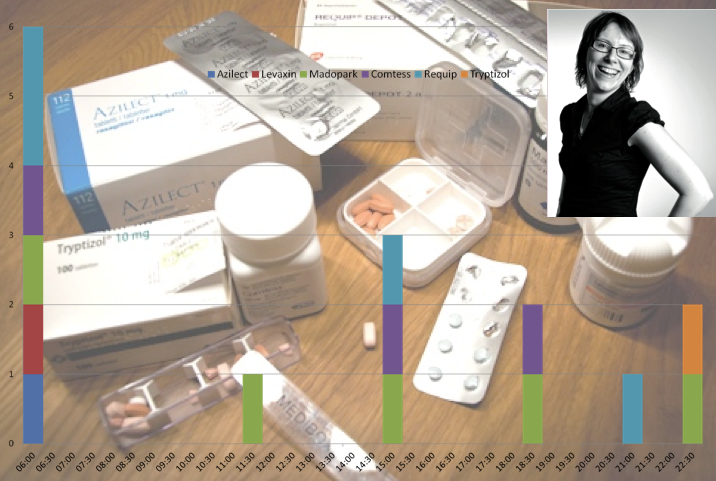 Result: Sara in this way managed to optimize her medication over time to improve her health. Sara of course collaborates with her neurologist, he encourages her and says “Sara, you know more about Parkinson’s research than I do!” Well, that is because Sara is of course very motivated and she now has these kinds of smart tools. 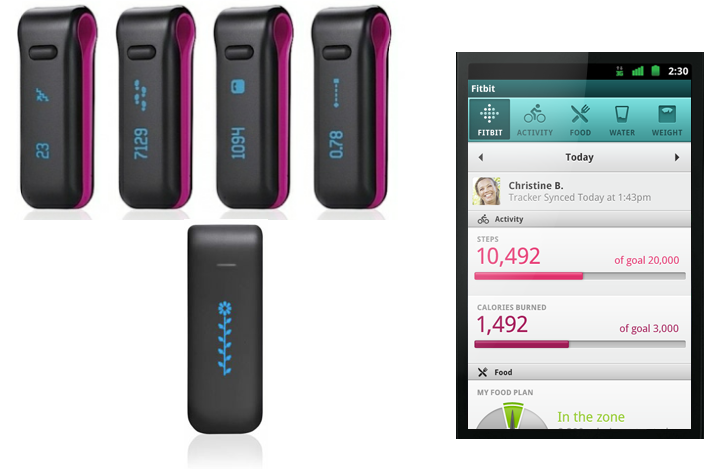 We are only in the beginning, the whole health sector, from fitness and excercise to chronic disease treatments is changing now becauseof all these new possibilities with M2M sensors and apps and the user empowerment. There is a very big chance for us in Sweden to be a global catalyst for this disruption. We have a forward-looking public sector, global telecom companies, world-class researchers and highly competent hardware and software developers. Let’s do it! 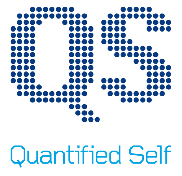 If you are interested in tracking data about yourself, join the Quantified Self Stockholm Meetup group that my project partner Ola Cornelius has started together with Sara Riggare and me, Henrik Ahlen. We started in April and are already 100+ members that meet and test new gadgets and share tips about all sorts of personal data tracking.